You may have never heard of the Babe Ruth Homerun Award. It is not an award that has been sponsored by a big corporation. It is not an award that has the endorsement of the baseball powers that be. It is an award and a concept that was created out of the passion that two ultimate fans had for their sports hero. It is the most professional and passionate of unofficial awards. The concept of the Babe Ruth Homerun Award was developed by brothers Jim and Brian Sullivan, both big baseball fans from the Boston area. 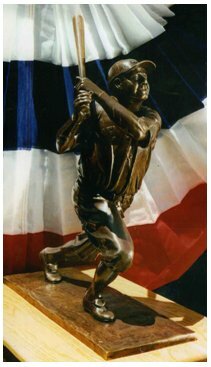 Jim was the sculptor, while Brian focused on the marketing concept of turning this great bronze statue of the Babe into the annual Babe Ruth Homerun Award, given to the baseball player who hits the most homeruns in the Major Leagues in a season. “My brother and I are big art collectors. And, my brother Jimmy is a very, very talented artist himself who had delved into a lot of different art mediums, but it turns out that he never sculpted anything in his life. So at one point, we took a course in foundry and he started out in clay, using dental tools and popsicle sticks. Then, he got some proper tools and it took him eight months to complete his first piece – which ended up being this great statue of Babe Ruth. He hadn’t done anything before or since, but it turned out to be quite a work of art. Jimmy had decided he wanted to do a statue of the Babe and I said ‘Okay, well why don’t you finish it and then we’ll shop it around New York to see who would be interested in funding a life-size version.’ I tried for 2 years with no luck. So when that didn’t work out, I started working on some other ideas. I considered licensing it and selling it as a piece of artwork, but then I thought, ‘Major League Baseball should recognize Babe more than they do. Baseball survived after the 1919 Black Sox Scandal because of the Babe. He put people back in the seats and, everything he did, he did for baseball.’ So the more I thought about it, I thought this piece should become a trophy for Major League Baseball and it should be given out to the Major League’s homerun leader. Babe Ruth led the league in homeruns 12 times, so I thought the idea made a lot of sense. Award presented in a 2001 pre-game ceremony at Wrigley Field. Award presented in a 2002 pre-game ceremony at Pac Bell Park. Award presented in a 2003 pre-game ceremony at Ameriquest Field. Award presented in 2004 pre-game ceremonies to Alex Rodriguez at Yankee Stadium and to Jim Thome at Citizens Bank Park. Award presented in a 2005 pre-game ceremony at Safeco Field. Award presented in a 2006 pre-game ceremony at Turner Field. Award presented in a 2007 pre-game ceremony at Citizens Bank Park. * Note: At the time that Alex Rodriguez received the 2003 award in 2004, he had joined the New York Yankees. At the time that Adrian Beltre received the award in 2005, he had joined the Seattle Mariners. BS A1: “My brother Jimmy doesn’t remember his first memory about the Babe. My first memories of the Babe go back to those scholastic books that they used to have in school and I always remember a black and white photo of the Babe. I was always a bit infatuated with him. BS A3: “Believe it or not, the guy who was the nicest and seemed to enjoy the award the most, was Barry Bonds. It turned out that, at the time that we were planning to present the award in 2002, Bonds had just broken the 600 homerun mark about a week before. So what happened was the Giants merged their ceremony for Bond’s 600th homerun with our ceremony. It was pretty exciting. BS A4: “My own belief is that anyone that could have the opportunity would want to associate their name with Babe Ruth and the homerun. It’s the biggest individual accomplishment in sports. Whether it be the most goals scored in hockey, being the scoring champ in the NBA or the most touchdowns in football, the most recognizable athlete is the guy that hits the most homeruns. Every night, whether it be ESPN or Fox Network, that’s all they show. It would be crazy if someone didn’t want to associate their name with the Babe. It should be noted that the Sullivans continue to personally fund the trophy. Each statue requires about a month and a half of time, as well as 12 people’s efforts to make, and costs about $4,000. The value of the trophy has been estimated at $50,000 by an art appraiser.